In flying 200m qualifying David finished 0.08 faster than Rob and both finished 5th and 6th respectively . In the first rounds they both qualified for a semi finals berth by winning their 3 up events. Sadly with the way the draw went it ended up a Twickenham CC head to head with Rob previously showing he was on great form by winning the Divisional Sprint competition only a few weeks early. David had other ideas and when they hit the back straight on the final lap it was a drag race, with Rob closing to be side by side as they hit the final bend. David however, took a huge breath/grunt and fought to hold Rob off, and did so to make the final. Rob went into the ride off for 4th to 6th which he won easily. David, however, was not having an easy time of it. Being drawn on the inside ( favourable position), the other riders decided to break the rules and dropped on top of him, forcing him off the track and gaining a 50 m lead. With the commissaires not taking any immediate action for this infringement( none at all later on), David chased and managed to get back on terms with the 2 riders, as they were playing cat and mouse at the top of the track. 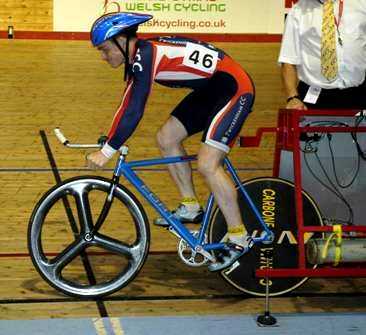 David decided to sneak underneath them and take the lead again, only for them to drop like stones, forcing him to back pedal to avoid a crash, and be forced off the track again – arrrggghh!!!! David got really angry and chased hard, getting side by side with the competition but just couldn’t hold on , what with riding further and farther by being up the track, and he was to finish 3rd. The commissaires were unable to make any decision and the positions stood, regardless of protests. Nicki Drinkwater qualified 5th fastest in her flying 200m and in her semi final ride she too was forced from the track by a similarly aggressive tactic which actually caused cuts and bruises. Nicki fought back to chase the girls all the way to the line and finished 5th overall. Nicki was up again in the 500m TT and she rode superbly to record a time of 40 secs, averaging 27.626mph, finishing 3rd and taking the Bronze medal. 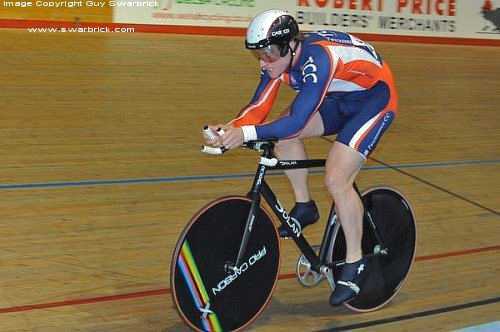 John Warnock was riding the Kilo TT, and in his first effort at this distance, he rode an excellent 1min 14 secs to average 30.317 mph. Not bad for a novice. 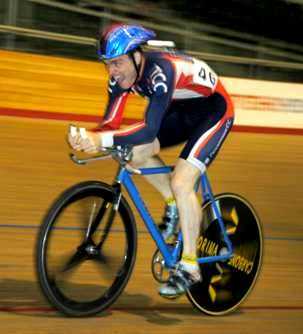 Rob’s age category 40-44 had him riding the 750 M TT and he blitzed round the track, averaging 31.768mph, to record the fastest time by half a second and take Gold. 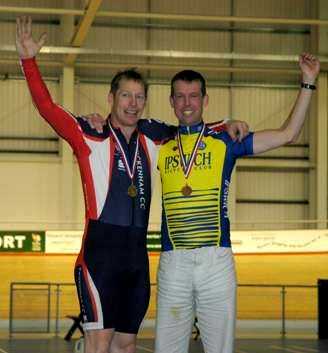 Rob Drinkwater fights all the way to the line to win Gold in the 750m TT. 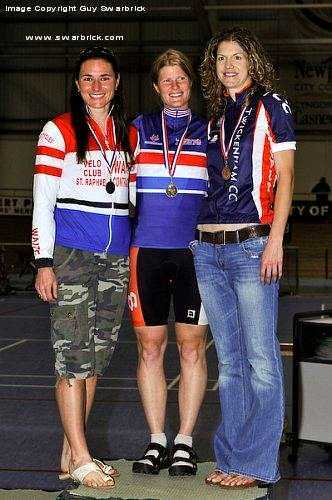 Nicki Drinkwater on the podium where she won Bronze in the 500m TT. David Jack and John Warnock involved. Johns race was unbelievably fast and his field was packed with many 1st and Elite Category riders. John rode a thoughtful race, followed the right people and only when the pace really went crazy in the last few laps did John lose touch , coming across the line in 7th place. Davids race was similarly fast and mid-way through, a break of 5 riders gained half a lap. David waited until his turn on the front where he put the hammer down, and in 3 laps, bridged to the lead group with only one of the seven riders originally on his wheel. As they came through with 4 to go, two riders tapped off the front and with no one willing to commit to a chase, they gained almost half a lap. David waited a little too long but still over took all but a few to finish 5th. David and John W involved . John was the only pursuiter and when he finished his 3000metres, he was very nonchalent saying he did ok!!! We checked the results later and he was 4th, only 2 seconds off Gold….awesome. David was first up and having spent the last few weeks in a state of semi illness, wasn’t expecting to last the distance. Bizarrely though, the race had a lot of ebb and flow, with riders trying to get away but then, when other riders made it up to them, they’d stop working and all would come back together. The first attack though was from David, who wanted to pick up some early points and escaped after 5 laps. The bunch was a bit too nervous and gave chase, catching him with a lap to go to the first points on offer. When the second lot of Points came round David was on the front with one to go and as the only rider to have done the Sprint event earlier in the tournament, he backed himself to not be beaten, which proved correct and he took his first points. The non sprinters then opened up more attacks which had David tailing off at the back recovering from his sprint effort. The attacks didn’t last long though and David clawed his way back to the bunch and with 1 lap to go to the next points he was on the front again, with the same result. At this point he was lying in first equal place. When the penultimate sprint came around he went to the front and was just pipped on the line but consolidating his points tally to take more points. Then came a huge attack from several riders which, with 6 laps to go to the finish, had David losing ground and trailing at the back of the bunch , half a lap down. Knowing he just needed to finish ahead of the attacking bunch to keep his points gained, David plugged away and came across the line not knowing where he had come till told later….a Silver medal. 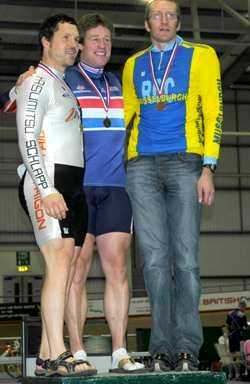 David on the Podium for the Silver medal in the Points Race. John Warnock’s Points race was a race of attrition, with many elite riders causing much pain and suffering to the bunch. John had been watching the earlier races and took no involvement in the early points laps, choosing to save himself for when the race really hotted up, and boy did it get hot. Attack after attack from other riders were quelled, many by John, who took points in the next 3 points laps, powering away from the field on one points lap to hold off the charging field to win 5 points by 10 metres. Then when the bunch came together for the last sprint John was overwhelmed by 4 riders, one of whom had to finish ahead of John to take second place. We weren’t to know it was this close and it wasn’t till the score board showed that 3 riders ended up on 12 points, John being one of them, but he finished close enough over the line to hang on for an unbelieveable Bronze medal. Points Race action from John Warnock – lying 3rd wheel, with bodies being spat all the time. 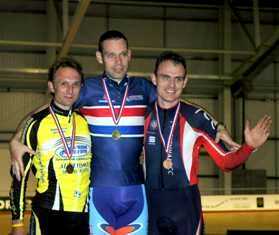 John Warnock and on the Podium for his Bronze in the Points race.